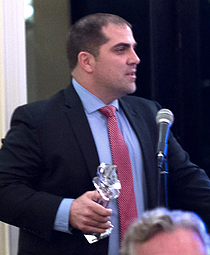 Shane Klepko had the honor of accepting the Collier Builders Industry Association (CBIA) award for 2014 Builder of the Year on behalf of Harwick Homes. He is a second year member of the Board Of Directors and encapsulates the Harwick principle of giving back to the community. He’s given countless volunteer hours within the community and is known for leading with integrity and sincerity while always creating a collaborative community where other talents are allowed to develop and stand out. His business acumen around remodeling homes for our own remodeling division has yielded growth in a department that is now fully operating in a way that helps owners reimagine their homes in ways that they’ve always dreamed of.